Gabon is located on the West Coast of Central Africa. Its colonization began in the first half of the 19th century, when France signed treaties with local tribal chiefs and established a protectorate over the coastal area. The French officially occupied the entire territory of Gabon in 1885. In 1910, Gabon became on of the four territories comprising French Equatorial Africa, along with French Congo, Chad and Ubangi-Shari (now the Central African Republic). 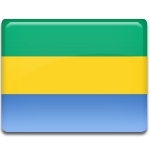 In 1922, the first political party, the Jeunesse Gabonais, was created in Gabon. It was anti-colonialist, but not anti-French. During the Second World War, Gabon was Vichy French for several months. When French Equatorial Africa was dissolved in the late 1950s, France agreed to give Gabon complete independence. Gabon became an independent country on August 17, 1960. Gabon Independence Day is a public holiday widely celebrated throughout the country. It is marked with official speeches, parades, drum shows, traditional dance programs, parties and other festive events and activities.